Here comes a quick update on the last week’s events. On Tuesday my brother and I started walking where I left off. 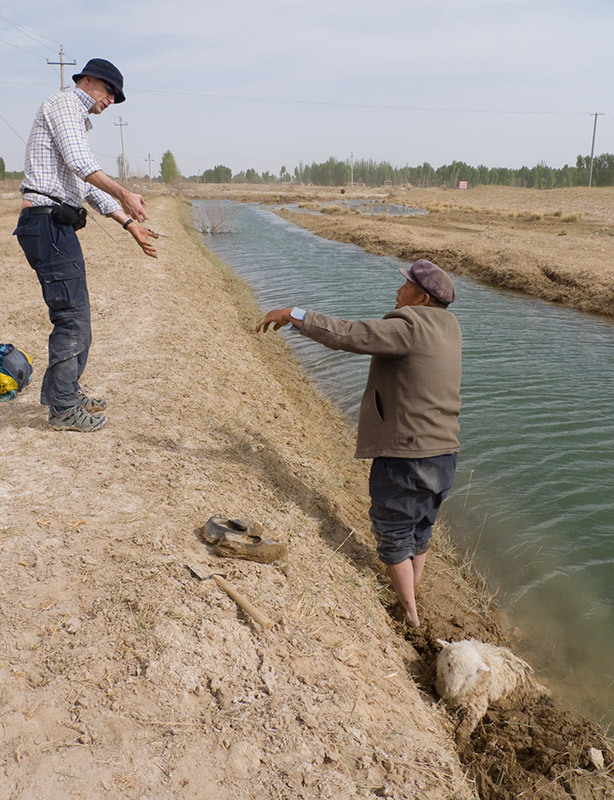 The area had quite a few irrigation channels to transport water from rivers and water reservoirs to the fields in the area. We stumbled upon a sheep that had fallen into one of the channels. Its hind legs were stuck in the mud at the edge. My brother and a Chinese guy tried to pull it loose, but it was firmly stuck. The Chinese guy decided he would get a spade to rescue it and we went on walking. After about 14 km (9 miles) we got to some water and decided to spend the night there just out of site of a small village. We had just set up the tents and were chatting to each other when a local came over and sat down between the tents. He was a really nice and calm guy and my brother spoke to him for a while. 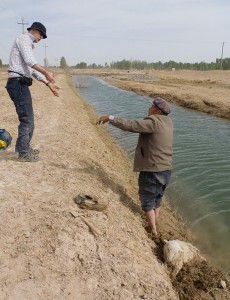 He told us that there had not been a single drop of rain in 2009. We are indeed in a desert. The night was a lot colder than expected, so the following nights we have put on all our wool to stay warm. My tent (a MSR HUBBA HP) is incredibly small! Hehe – it is great because it is VERY light weight, but since it only has about 5 cm (2 inches) of ‘space’ on each side of the sleeping mattress, it feels slightly claustrophobic. I’ve got used to it already though and it is very quick and easy to set up. The small ‘footprint’ means it can be set up almost anywhere. So finally the night came, the first night in Hubba! For sure it´s a small tent and for sure you will either marry your brother or hate him for the rest of you life 😉 Perfect though to be two i a small place when cold is coming. I really hope that the telfphone problem will sort out quickly so we will be able to follow you more closely! Take car!